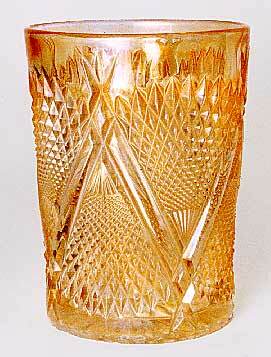 A rare tumbler, the marigold example shown was photographed while in the collection of the late John Britt. In 1996 one with base damage sold for $290 and sold again in 1998 for $300. Another auction in 1998 saw one, also with base damage, sell for $260. The most recent sales were in 2010 for $275 and 2011 for $300.